We are feeling very thankful for the community and friends we have built here at Proof Kitchen + Lounge, and we want to thank all our diners for making Proof the place to come with friends, celebrate with loved ones and where you satisfy that insatiable burger craving. We truly love getting to know our guests and wanted to take a moment to flip the switch and give our guests the chance to learn a little more about our unseen team here. 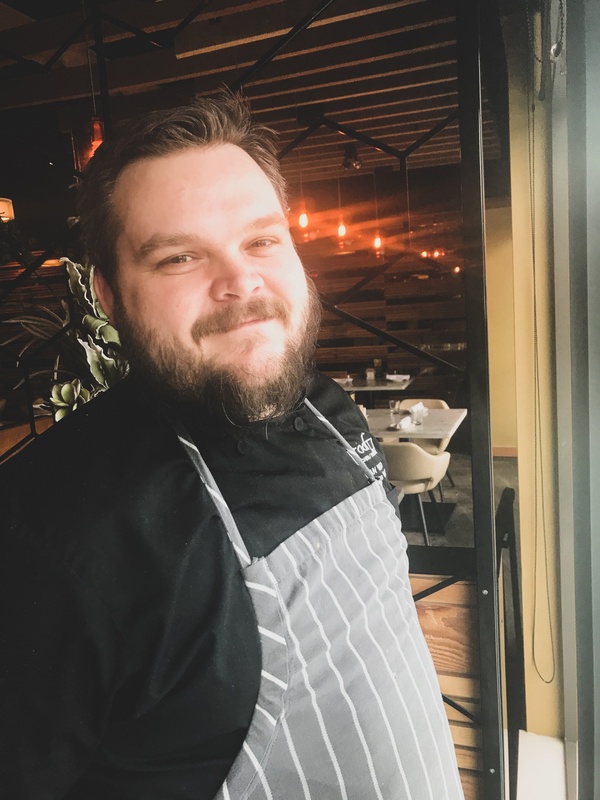 We sat down with our sous chef Ryan Reid to find out more about what brought him into the culinary trade and why he chose Kitchener-Waterloo region to explore his passion. A staple of the Proof Team, Ryan demonstrates what we look to bring to every dish, table, and experience here at Proof. Professional, creative and dedicated to the guest experience, you truly couldn’t ask for a better team leader. Like many of us, Ryan’s career search started in a different direction. Working in the kitchen was a means to afford school, not the end goal. However, his time in the kitchen proved to be exciting, challenging, and gratifying. Once outside the kitchen, he found the employment he had worked towards lacked a certain ‘realness’ that was so present in a high-paced kitchen. He was keen to return to the high-energy, people-focused industry that also helped him discover his creative side. “There is a creative side to cooking, with so many ways to create your end product, there is no such thing as a perfect dish, everyone feels and tastes differently”. With that attitude, Ryan has opened infinite possibilities that create amazing results. What is it about the Kitchener-Waterloo region that makes it such a great place to be in the food and service industry? With so many diverse and talented restaurant’s in the area, why Proof Kitchen & Lounge? For the local or out of town diners, Ryan finds Proof to be an aesthetically beautiful and interesting place, with so much dining diversity from your sitting location to your menu selection. The location of the hotel allows us real diversity in the guests who dine with us, and their feed back and experience become very meaningful as we understand ourselves on a larger stage. Ryan takes what could be considered a problem for the restaurant become an opportunity for the team. While remarkably talented and skilled in the kitchen, Ryan’s best qualities is without a doubt his attitude. His humorous anecdotes and resilience during a busy service inspires his team persevere and not lose track of the ultimate goal – put out mouth-watering, delicious dishes. His personal commitment to the sustainability movement and supporting local business makes him a crucial and ever appreciated member of Proof’s team. Proof’s new Spring/Summer menu is set to be released this coming April. According to Ryan we can expect to see the shift from hearty, winter comfort foods to “eating with all five senses, with summer flavours, summer colours, brightness will be a theme”. We can anticipate fresh and exciting patio meals that will compliment you drink and elevate your summer dining.